Heating and cooling comfort from the ground up. With tax credits to save you money. Did you know that over 50% of your utility costs come from heating, cooling, and water heating? Now, that’s something you can control. Turn your lawn into a permanent power plant for your home. What does the word “Geothermal” mean? “Geothermal” comes from the Greek words geo (earth) and therme (heat). So geothermal means earth heat. Our earth’s interior – like the sun – provides heat energy from nature. 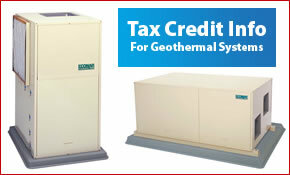 This heat – geothermal energy – yields warmth and power that we can use without polluting the environment. Geothermal heat originates from Earth’s fiery consolidation of dust and gas over 4 billion years ago. At earth’s core – 4,000 miles deep – temperatures may reach over 9,000 degrees F.
In today’s economic climate, wise purchases are more important than ever and with skyrocketing prices of natural gas, propane, and fuel oil, many have found that a geothermal system is a smart choice. Geothermal heating and cooling systems operate at a fraction of the cost of ordinary systems, saving you money every month. 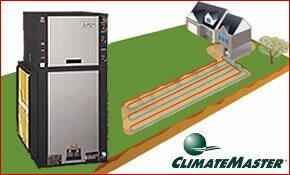 In fact many homeowners save as much as 60% in energy costs with a geothermal system. That’s because geothermal systems tap into the free renewable energy found in your own backyard. 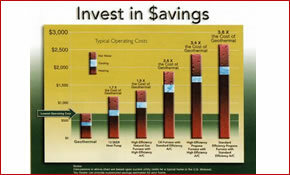 In an uncertain economy investing a little time and money in Geothermal energy is one way to yield guarnteed returns. It pays to be energy efficient. Geothermal heating and cooling systems efficiently provide safe, clean, and enviromentally responsible comfort for your home. An optional hot water generator can help provide your family’s domestic hot water needs at a fraction of the cost of electric or gas water heaters. For more information and an analysis of saving potential, contact us – 715-476-2100.